Disk fragmentation is generally main cause of slow and unstable computer performance. 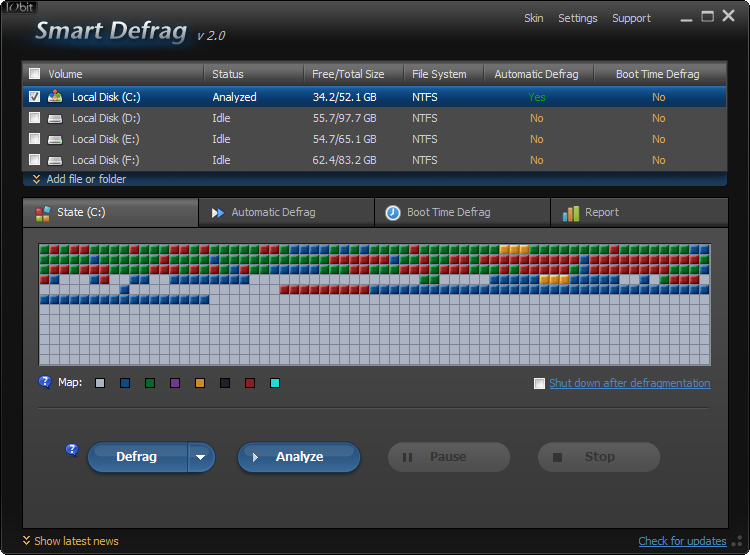 Smart Defrag helps defragment your hard drive most efficiently. Smart Defrag not only defragments computer deeply but optimizes disk performance. With "Install it and forget it" feature, Smart Defrag works automatically and quietly in the background on your PC, keeping your hard disk running at its speediest. Try it, you might like it and they have all kinds of software that is most excellent. There tech support is also excellent, never had any kind of problem with them. Installing the version installed a malignant version of Yahoo despite my saying NO to installing it, Worse than pure adware. I won't touch any of IObits' software after they ripped off MBAM data. Install anything by this company at your peril. Are you sure it's 4.03.275 and not 725? Adds crap when installed & also adds 2 startup entries - You can do far better than this, mostly used by IOBIt to get you to try their other products. Smart Defrag needs to stop including the PUP Open Candy. This is like the 3rd time MalwareBytes has flagged this PUP during the Defrag download on BetaNews. Pros: I been using all of IObits software for years and love it. Those who say it is junk obviously have no clue how to use it. I have never had a problem with it or any kind of install problem. I does what is says it will do and is well worth the money. Bottom Line: Try it, you might like it and they have all kinds of software that is most excellent. There tech support is also excellent, never had any kind of problem with them. It's definitely faster by far than any other defragger I've used, and it's passed scrutiny at Gizmo's and Major Geeks. In spite of one past instance of malefaction, in which IOBit was caught stealing code from other security software companies, and although I have yet to install this very latest version of IOBit defrag, I am reasonably comfortable giving it a...wait for it.....5! Again this is the incorrect download. The link for this newest version game me the 3.0 build, not the 3.1. Iobit site doesn't even have this build up.